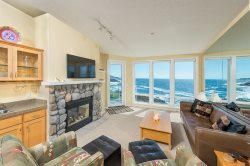 Watch the whales and boats year round from this luxurious north end-unit condominium on the first floor in Depoe Bay, the Whale Watching Capital of the World. You will enjoy quiet seclusion and perfect accommodations with two king-size suites, a third queen-size bedroom, and two spacious baths, one with a jetted spa tub. BEAUTIFUL NEW tile flooring in kitchen and bathroom. This "Great Room" floor plan with spectacular views and a fully appointed kitchen allow a truly relaxing get-away. In Whale Watch you will have a ringside seat to view the mighty Pacific during our mild Oregon Coast summers and its raging fury during majestic winter storms. BlueRay, NetFlix, and Wifi are also provided - all the luxuries of home with an incredible ocean view. All their Depoe Bay units are very nice. Website is easy to use and staff respond quickly via email and phone. Whitney is courteous, knowledgeable and professional. Awesome, that's why I've been using you for years. Stayed in this unit at least twice. Comfortable and roomy floor plan for 4-6 people. Stunning ocean view and storm watching. Always see at least one whale, usually more. Beds, linens and towels are luxurious. Kitchen is well equipped. We had a fun, relaxing and enjoyable experience. Everthing from toilets to the refrigerator to the floors are immaculate. This was our first time renting through Airbnb and with Blue Pacific. I dont think we will ever stay in a hotel again. This was amazing. Whale Watch is even better in person than the photos show, and we thought the photos were stunning. We stayed here with another couple we travel with often. We all loved that we each had our own private suite. Location is outstanding, easy to find and has wonderful ocean views. The condo is extremely clean. The living room furniture is sooooo comfortable. King beds were a bit too firm for our tastes, but some people like that. Lots of comfy pillows and extra blankets. Kitchen is well stocked. Nice amenities in bathrooms. Thank you, Blue Pacific! All positive. This is my fifth stay at one of your condos in Depot Bay. and it won't be my last. Think it has the best veiw of the crashing waves of all the units I have stayed in. Very comfortable and agree with my daughter that it really feels like home. We saw the amazing sunset that was the best I have ever seen in my 82 years. Would recommend this unit to anyone who wants to have comfort and a great veiw of the wild life and crashing waves. Loved it, looking forward to doing it again soon. Everything was taken care of in a timely manner. Confirmations were received and the code was e-mailed when we expected it. Awesome, awesome, awesome! This is the most amazing location for watching whales in the summer. We saw no whales here in October but that was because of the huge storm waves. It was just as awesome to watch the storm as it was the whales. This property is well cared for and well appointed. We have rented many homes and stayed in many rooms on the Oregon Coast in the last 50 years and this one rates at the top! rental process very easy and not stressful. We booked this reservation through Air BnB and the response from Blue Pacific was immediate and thorough. They answered all my questions and provided all the information we needed before we got there. We stayed at Whale Watch with 2 other couples and had a fabulous time. Everyone was very impressed with the condo - its features and its location. We were right on the water and had whales within 50 yards of the deck. We enjoyed beautiful sunsets and would stay here again. Didn't do much interacting. Called to ask about a portable crib and they were helpful and gave me accurate information. Easy check in, check out. Booking easy. Good communication, well priced. Wonderful! Very clean and well supplied. Great location, great views. Loved the giant windows overlooking the ocean and seeing whales come up very close. What's not to like? We've been coming to these condos for at least 14 years (we think) and have never been disappointed. Love the feeling of privacy and of course, the view. We saw lots of whales this time, when we really weren't expecting any. We usually come in the spring. The agent I spoke with on the phone when I paid the second half of the rental fee was friendly and very pleasant. We were so happy with the #20 unit where we stayed in Depot Bay. The condo was beautiful, well kept and so homey feeling. While our son found Blue Pacific and initiated the rental, our part of the interaction was simple and pleasant to deal with. We were very happy with our stay at Whale Watch. We will definitely come again. The condo was clean and well cared for. The favorite feature was view from the living room, dining room and kitchen. The whale watching was awesome!! The team members were friendly and g ave us all the information we needed, sent many emails to remind us of the upcoming date. They made sure we had the address and the code to get right in.P lenty of parking. We didn't have any issues so when we were there everything was easy to find. We are in love with this adorable condo. It beats a hotel hands down. Comfortable beds, sand buckets for the beach, darling decor, tons of comfy pillows. The fireplace was nice when it got chilly. The kitchen was well stocked. Plenty of room for everyone. The binoculars were a nice touch. We didn't need one thing. Every appliance worked. The dishes, wine bar, laundry, dish soap, and every utensil you could think of. It was also well organized Two master bedrooms! The ocean and whale watching right out the back door They thought of everything a guest would possibly need and more. We will be back! This will be our go to place from now on. Great, questions are asked before we thought of them, and written so we could refer to them, and be assured. This was the Oasis we were hoping for, and we left the Oregon Coast with new energy, completely rejuvenated.